Australia – November 15, 2018 – Nilfisk, a leading global provider of professional cleaning solutions and services, has released its financial results for the third quarter of 2018. 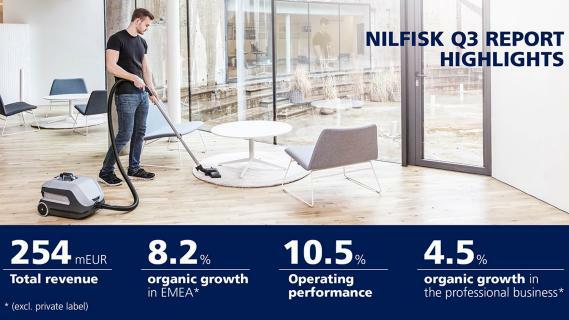 In Q3 2018 Nilfisk posted organic growth of 2.6% while delivering an operating performance of 10.5%, an improvement compared to Q3 2017. In addition, Nilfisk executed significant strategic initiatives including the divestment of the company’s Outdoor business and US restauration business. Nilfisk’s total revenue amounted to 254 mEUR during the quarter. This performance was driven by positive development in the EMEA region, which delivered 8.2% organic growth (3.9% including private label sales). Mature markets such as Germany and France showed double-digit growth. The Specialty Professional segment performed at a satisfactory level while the Americas region demonstrated flat growth. “During the quarter our growth in Americas has been below expectations. However, our branded professional segment as a whole grew by 4.5% organically, which is the strongest for any quarter of 2018 so far,” comments Hans Henrik Lund. In the first nine months of 2018 total revenue was 795.6 mEUR, with organic growth of 3.3% and an operating performance of 11.2%. For 2018 as a whole, Nilfisk expects an organic growth of approximately 2% and an EBITDA margin before special items in the lower range of 11.5%-12.0%. About Nilfisk: Nilfisk is a leading global player within the professional cleaning industry. With more than 110 years of innovation experience, Nilfisk is dedicated to delivering reliable solutions and products of high quality that pave the way for a safer, more productive, and cleaner day for millions of companies and private homes around the world. Nilfisk has its own sales companies in 45 countries, and its products are sold in more than 100 countries. Read more at www.nilfisk.com.au.